Managers at Nottingham East Midlands Airport have revealed they are considering a name change. 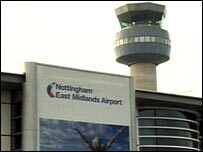 Nearly three years ago Nottingham was put in to the airport's title but the change caused controversy. Business leaders said that the current name does not promote the region nationally and internationally. Managers said they were considering the change following responses by people to the airport's master plan proposals. A decision is expected in December. The airport's managing director Penny Coates said: "The name change was something that was raised, it's being considered alongside all the other issues that were raised about the draft master plan. "It was one of the things that was raised as an issue. We will respond to all of them. "We have to look at the balance as to what is the right thing to do." Michael Copestake, of Marketing Derby, said: "It hasn't helped the East Midlands to develop itself as a region and that has been a problem. "If we are going to promote the East Midlands as an area to do business in, if we've got the main airport that doesn't carry that logo it doesn't achieve that objective." Lee Stokes, editor of Business Confidential magazine, said: "The airport was pressured, by what we hear, at the time by one of their main customers to change the name. "But the name change hasn't really had a big impact at European airports - it is still referred to as East Midlands Airport on the electronic notice boards." Mrs Coates said the name was changed originally because people travelling into the region did not know where East Midlands was but they did know where Nottingham was. She said the airport has seen a significant increase in inbound passengers as a result of the change. Martin Traynor of Leicestershire Chamber of Commerce said: "The fact that we have an airport that is actually located in Leicestershire called Nottingham East Midlands Airport is a bit bizarre."